Translated survey content (questions, competencies, rating scales, etc.) can be uploaded into the EchoSpan admin tool. 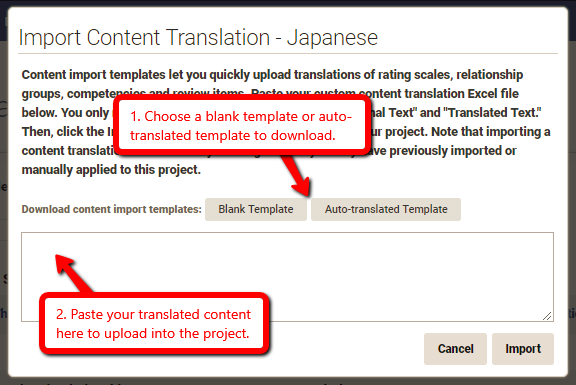 You can upload your own content or use auto-translated import templates built in Excel to expedite the process. Click "Import Content Translation." Here, you can upload your content or download import templates. The auto-translated template version will automatically translate the existing English content into whatever language was selected in the previous step. Once the file is downloaded, you can review and edit the translations as desired. Once your edits are complete, copy and paste the file back into the system in the text box under "Import Content Translation." Once uploaded, the translations are reflected in the language translations interface. NOTE: This feature is only available in the Enterprise Edition. If you are using super- competencies in any of your projects, please contact support@echospan.com before using this feature.